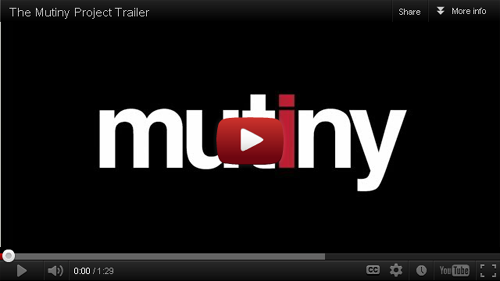 Last week, we talked about a brief interlude to our re-boot story called The Mutiny Project. The mutiny begins today and it’s pretty serious business. Recent technological trends (primarily increased transparency, increased access to information, and the decentralization of power) have utterly changed the business landscape. Any intelligent business still alive has had to re-examine itself quite intensely, including us. A newer, more human, way of doing business is the only way to survive these changes. At this point it’s safe to say this is not just an idealistic notion, but an empirical fact. Some businesses have aligned themselves with these new ways, while others cling to the old like alchemists in an age of chemistry. Unfortunately, the alchemists are still teaching the old ways to aspiring entrepreneurs, and these aspiring entrepreneurs are finding themselves ill-equipped to survive. The Mutiny will occur in multiple “waves” over the coming months. The first wave was released today. The Mutiny materials have been made freely available to the public (delivered through your Simpleology account), and we’ve assembled additional supporting materials and extended interviews for our Elite members. Enjoy. And please come back to let me know what you think once you’ve had a moment to check out the first wave. This is just the beginning. This sounds like nothing less than a revolution! @MarkJoyner I am looking forward to it Mark. .
very interesting! certainly will participate!